MESH: Designing, Up-Cycling and Filming! CBN Foundation wanted some bags for first aid and health products that they will gift to children and mothers after holding health talks. They asked if something could be developed in MESH Design Studio. Our Designer Syamala, came up with something which is made from waste fabrics and she trained people with disabilities to sew them. 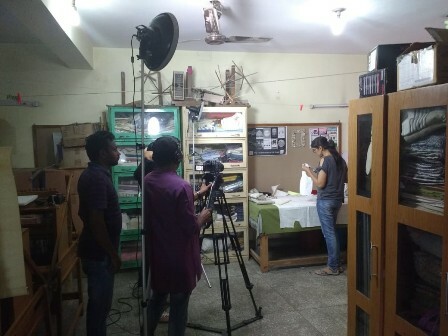 This week CBN sent a film crew to MESH Design Studio! 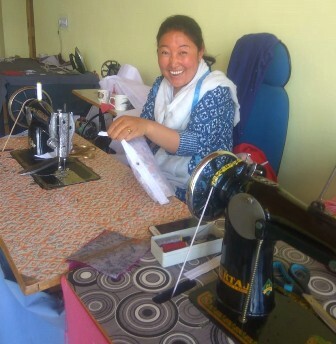 The bags have been made in Bharat Mata Kusht Ashram, a leprosy community in Faridabad and also by the tailors in PAGIR in Leh, high in the Himalayas. Sonam (pictured below) who is hearing impaired is their lead tailor, she has learned how to make the bag from images, and short videos sent by MESH Designer on Whatsapp!